My work is as much about how I make as what I make. 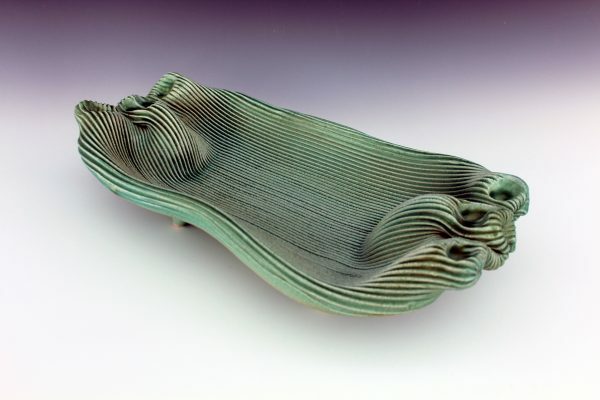 The physical properties of clays are a major part of the attraction for me. The immediacy of the material allows the marvellous combination of head and hand to work together. I like to invent, to surprise myself, to struggle to something just out of reach, and I am most excited by making discoveries that add to my continuous long term development. Working with clay for me is like a journey where you always want to see what is just round the next corner but also occasionally go back to look at something anew or check for things not noticed on the first visit. My approach has resulted in my work, when seen over a long period, being very diverse – but I rarely repeat old ideas unless I see the chance of an extension of the original. Most of my work is hand built slab work often using thin sheets if clay. I do occasionally coil, throw, or use casting slip (but not necessarily in a conventional way). The work I produce is sometimes sculptural, sometimes functional, but always, I hope, interesting to look at.